Amid all the frenetic action down the field at a brilliant Bahrain Grand Prix, some interesting details emerged about several of the leading teams. The battle for victory between Lewis Hamilton and Nico Rosberg proved just how quick the Mercedes cars are. After the safety car pulled in to leave a 10-lap sprint to the flag, we saw Mercedes stretch their legs in true, ultimate race performance for the first time this season. They pulled away at at least two seconds a lap, which was pretty stunning. Before that, on the laps when Hamilton and Rosberg went wheel-to-wheel and lost lots of time, they were still quicker than anyone else. Sergio Perez buried memories of a tough start to his Force India career in the first two races of the season with a strong third place, but that position should probably have gone to team-mate Nico Hulkenberg, notwithstanding the engine problem that slowed him down in the final stages of the race. Had Hulkenberg qualified where he should have done - on the second row, where Perez put the car - I suspect he would have had the strength and pace to go on to finish third. He had a problem with his engine's energy harvesting late on but he would probably have already been in third position by then. As it was, a mistake in Turn 11 in qualifying meant he lined up 11th, which was very disappointing considering he was fastest of all in the first part of qualifying. Williams also faded after promising so much. Valtteri Bottas started third on the grid, with Felipe Massa in seventh. Massa was soon up to third after a brilliant start, with Bottas in fifth. To go from there to finishing seventh and eighth was a disappointment. They struggled with tyre degradation and were very early coming in for their pit stops. That meant both drivers were on the back foot after that. Williams only did 65 laps over Friday and Saturday morning, saying they had a very good data from the eight days of pre-season testing in Bahrain. But all the other teams were at the test, too, and that was significantly less running than anyone else. Force India, the main team they were battling, did about 50 more laps. It turns out Williams were managing engine mileage, which would explain at least part of the reduced number of laps. On pure pace, Williams have been probably the second or third fastest team so far this season, so they really would have expected to have a podium finish or two by now. They already have an awful lot more points than they did last year, but they should have even more. I'm sure they will have gone away from Bahrain a little disappointed. Teams such as Williams need to maximise their opportunities to score big points and podiums while they can, before the greater resources of Red Bull and Ferrari start to tell in the development race and getting good results becomes that bit more difficult. Ferrari were "nowhere" at Bahrain with Fernando Alonso (pictured) ninth and Kimi Raikkonen 10th. 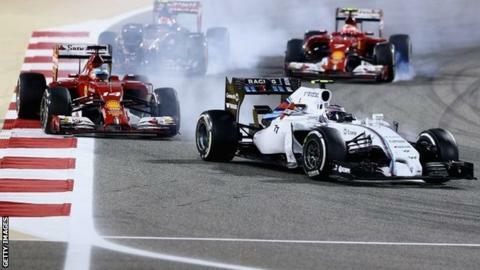 It was not so much missed opportunities that defined Ferrari's weekend in Bahrain as missed performance. They were nowhere. The car has three problems. The engine does not have enough top-end power, it is thirsty and it does not have enough traction. The increased torque of the modern F1 power-units puts extra emphasis on traction and it is an area in which Ferrari have been weak for a few years now. It has been clear from the start of the season - I remember looking at their rear tyres in first practice in Malaysia and they had been working very hard. The situation improved over the weekend, to the extent that Fernando Alonso was able to finish fourth in Sepang, but it remained an issue. In Bahrain, where traction out of slow corners is critical to performance, poor traction and lack of straight-line speed meant Ferrari were exposed and Fernando Alonso and Kimi Raikkonen could do no better than finish ninth and 10th. I'm sure their president Luca Di Montezemolo, who was watching from the pits for much of the race, did not leave Bahrain a happy man - and not just because his comments about "taxi driving" had been shown up by a great race. One final observation, and it is about the unheralded teams at the back of the grid. Max Chilton's 13th place for Marussia could very well be decisive at the end of the season in constructors' championship. It is Chilton's second 13th place of the year, while Caterham have only one through Kamui Kobayashi. If Marussia can hold on in 10th place to the end of the season, it would be the second year in succession they had done so. And that would mean millions of pounds in prize money at the end of the year.